Oculus has officially confirmed that Toybox, the highly anticipated multiplayer sandbox application built from the ground up to show off the Oculus Touch motion controllers, will be made available to every touch owner for free after launch. Oculus Touch debuted at a special event just prior to E3 2015 alongside the final retail design for the Rift and went on to make quite an impression at the gaming expo shortly afterwards. At the time however, it was early days for software Touch support. At Oculus’ E3 booth backstage booth, there was just one application on show to demonstrate Oculus Touch and its capabilities. Toybox was an unapologetically barebones application, filled with what Oculus founder Palmer Luckey described as “programmer art” (simple, flat-shaded 3D objects) all brought to life with a realistic physics model. The demonstrations were given to two players at a time, each occupying a separate ‘room-scale’ booth isolated from one another, each kitted out with two Oculus sensors. The players joined each other via networked systems, communicating via the Oculus Rift’s integrated microphone. There were blocks to stack, shrink rays to use on your companion, table tennis bats, fireworks to set off and slingshots to play with. Toybox was indeed an apt name for the demo, but most importantly it was an incredibly effective way to show how accurate and effective Oculus’ ‘Half moon’ prototype controllers were, powered by the same outside-in ‘Constellation’ tracking as the Rift itself, really were. The application was a big hit and after HTC’s Vive made its debut at GDC earlier that same year, sporting their extremely impressive room-scale tracking and incredibly precise SteamVR motion controllers, it felt like the wait for Oculus’ own answer to the question of hand presence in VR had been well worth the wait. Now, as we approach the launch date for Oculus Touch on December 6th, the question remained as to whether Toybox would remain a trade show demo app only or whether the wider public would have a chance to sample its delights once hardware reached them. 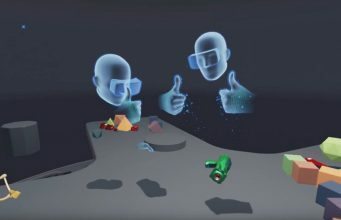 A few days ago, Oculus’ Head of Content Jason Rubin tweeted to clarify the state of the Touch’s freebie content, seemingly letting slip that Toybox would indeed make its debut at launch. However, some confusion remained whether this was an official announcement or an error on Rubin’s part. So, we reached out to Oculus for clarification and they confirmed that Rubin’s tweet was indeed accurate and Toybox will join Dead & Buried, Oculus Medium, First Contact, Oculus Quill, Robo Recall and The Unspoken as packed-in content for all Oculus Touch pre-orders. We took at look at each of the free pieces of content made available to Touch owners in this article a couple of days ago and it’s hard to argue that Oculus isn’t going out of its way to give those still on the fence about investing in Oculus’ motion controllers a chance. Ben Lang also took an in-depth look at Oculus Medium, the company’s impressive virtual sculpting and modelling application. We’ll have a full and detailed review of Oculus Touch up on launch day so check back then for our verdict. The post Oculus Confirms ‘Toybox’ Will Come Free with Touch appeared first on Road to VR.